Plants have also mastered the art and science of aviation. And they did it long before Orville and Wilbur Wright propelled their frail craft into the air. We see this most often in the way seeds navigate to suitable soil. If a tree dropped its seeds straight down, the seedlings would have to try to grow in the shade of the parent tree and would soon choke each other out. Seeds need to be transported away from the parent tree or plant, and this is accomplished in a variety of ways. The most interesting example is probably the winged seed of the tropical liana. It grows high up in the branches of its parent tree amid beautiful, shining green leaves. The liana seed develops two curved wings, transparent, gleaming, and very elastic. When the seed releases from the tree, it glides away in the breeze. Early aviation pioneers were also impressed with the perfect flight of the liana seed. In building craft light enough to soar in the wind, stability was the key. Early flying machines kept falling apart. But the liana glider's gossamer winds were remarkably stable. And so two flying pioneers, Etrich and Wels, made use of the liana seed in designing a tailless glider. The craft that resulted in 1904 proved to be a milestone in aviation history, gliding for about 900 meters. Another technological marvel pointing to nature as the mother of invention. Like an endless army of parachutists released from an airplane, seeds and fruits travel the wind currents and gentle breezes of the earth. Literally hundreds of species have adopted this remarkable method of dispersal including seeds that with 2 lateral wings and when released from their fruit sail through the air like a glider. One of the best examples of this method of dispersion is the winged seed of the tropical Asian climbing gourd Alsomitra macrocarpa a tropical vine in the Gourd Family (Cucurbitaceae) native to the Sunda Islands of the Malay Archipelago. Football-sized gourds hang from the vine high in the forest canopy, each packed with hundreds of winged seeds. The seeds have two papery, membranous wings, with a combined wingspan of 5 inches (13 cm) and capable of gliding through the air of the rain forest in wide circles. Although the seeds vary in shape, some of the most symmetrical ones superficially resemble the shape of the "flying wing" aircraft or a modern Stealth Bomber. According to Peter Loewer, Seeds: The Definitive Guide to Growing, History, and Lore, 1995, the aerodynamic seeds spiral downward in 20 foot (6 meter) circles, although a gust of wind would probably carry them much farther away. Makrozanonia Metacarpata (Alsomitra macrocarpa) Plantlife's "Ideal Kite"
The Taube's wing design is based on the zanonia tree seed pod, which drifts through the air for great distances. First produced for sporting purposes, Taubes were later used for observation and training by Germany and Austro-Hungary during World War I. Ironically, the Taube (meaning Dove, the peace symbol) was first to drop bombs in war; the Balkans in 1911 and Paris in 1914. Specifications: span 46 ft. 8 in. ; length 32 ft. 4 in. ; takeoff weight 1750 lbs. ; engine 100/120 hp. Mercedes water-cooled six-cylinder in-line (original); 200 hp Ranger water-cooled six- cylinder upright conversion (representation); maximum speed 60 mph. Editors Note: The Taube though not a tailless craft - but none the less utilising engineering concepts from Etrich's gliders is therefore represented here buy a number of references and images for those wishing to follow the design concept through to its final form. Igo (Ignaz) Etrich - b. 25. 12. 1879 Oberaltstadt (Horejsí Staré Mesto, CZ), † 4. 2. 1967 Salzburg, Pionier des Flugzeugbaus, meldete 1905 ein Patent für Flügelform und Luftschraube bei Flugzeugen an, konstruierte 1907 das erste ö. Motorflugzeug, 1910 die "E.-Taube" (Eindecker), 1911 das erste ö. Militärflugzeug. Seinem Mitarbeiter Franz Wels gelang 1906 der erste Flug eines Menschen in Ö. (Gleitflug). Literatur: I. E., Memoiren, 1962. 24.12.1954: Am 25. Dezember vollendet der Flugzeugkonstrukteur Igo (Ignaz) Etrich in Freilassing sein 75. Lebensjahr. Zu Trautenau in Böhmen als Sohn eines Textilindustriellen geboren, erhielt er die Möglichkeit, sich eine Flugzeugwerkstätte einzurichten und Versuchte mit Gleitfliegern ohne menschliche Besatzung durchzuführen. In der Folge übersiedelte er nach Wien, wo ihm das Handelsministerium auf dem Rotundengelände einen Pavillon zur Verfügung stellte. 1905 erhielt er das erste Patent auf einen Apparat mit 12 m Spannweite, 1906 baute er sein erstes Motorflugzeug. 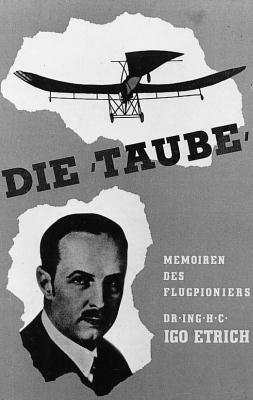 Eine neue Konstruktion führte zur "Etrich-Taube", mit der der Pilot Karl Illner sämtliche österreichische Rekorde im Hoch- und Dauerflug gewann und auch den Preis der Stadt Wien errang. 1912 gründete Etrich in Liebau die "Etrich-Flieger-Werke" und vor dem Ersten Weltkrieg die "Brandenburger-Fliegerwerke". Nach 1918 betätigte er sich in der Textilindustrie, da die Friedensverträge die Flugzeugproduktion verboten. 1944 erhielt er das Ehrendoktorat der Technischen Hochschule in Wien, 1945 mußte er aus Trautenau nach Bayern übersiedeln.